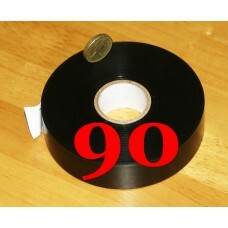 The best price for our 25mm PVC tape is reserved for our 90 roll bulk carton. This PVC tape is much thicker and stronger than standard 110 Micron tape with a thickness of 190 Micron and has a high dielectric strength. Check the value against our competitors with our 40m rolls at the delivered price shown it works out at less than 1.5p per metre which is exceptional for this quality of PVC tape. For football clubs where a strong tape is required as sock hold ups or net ties this tape is the best and is also used by rugby players.